When Choosing Your Grocery Shop, Fresh Matters Most! | Supermarkets in your pocket. Home › Credentials › When Choosing Your Grocery Shop, Fresh Matters Most! When Choosing Your Grocery Shop, Fresh Matters Most! We note from the Spanish trade press that DIA, a discounter with 7,000 stores in Spain, Portugal, Brazil and Argentina, is yet another major grocery retailer that is embracing the fashion to excel in fresh foods. In the Spanish market, DIA has developed a new convenience format with a focus on fresh. Also, it’s refreshing the larger format Maxi DIA stores to include new meat and fish departments with 500 professionally-trained fishmongers and butchers. 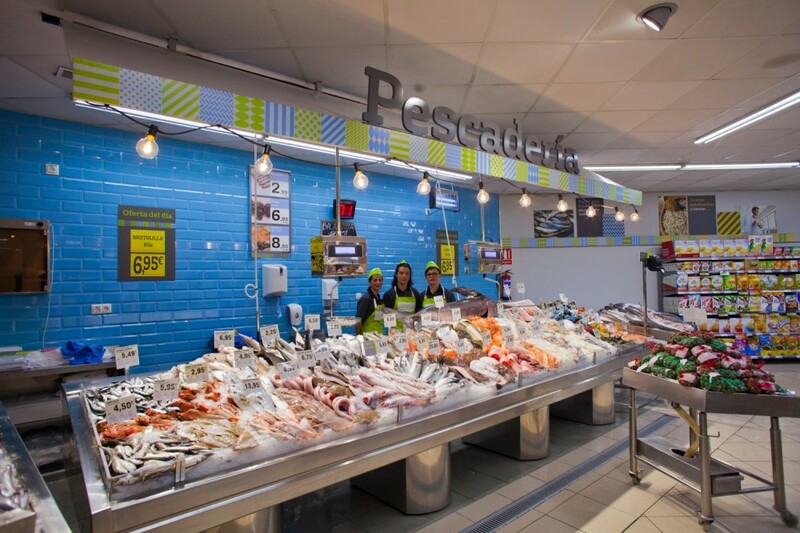 The independent fresh food retail trade is still very strong in Spain and a quick look around the High Street confirms this: eye-catching displays of fresh meat/fish managed by store owners who understand the attraction for shoppers of “food theatre”. Excelling in fresh food is not only a challenge for discounters in Spain – mainline supermarkets have struggled to dislodge the traditional trade. Pre-recession, supermarkets barely held 50% of the fresh meat and fish market (whereas, in the UK, the multiples have 90%+ share), but over the past 6 years, the Spanish chains have taken 8% share points from the independents, largely through aggressive price promotions which have appealed to cash-strapped shoppers. Mercadona has been another supermarket business in establishing its fresh food credentials. Senor Roig, the chain’s owner, recognized that his earlier focus on stripping costs out of his business and making processes simpler and more efficient worked well for shelf stable packaged goods but reduced quality, availability and damaged shopper perception of the store’s fresh offer. Competitors such as Carrefour, Auchan and Eroski are paying much more attention to fresh foods, too: with better consumer communications; claims about provenance; fresh promotions; and more innovative cross-selling. When retailing fresh foods, the story is an integral part of the product mix. The challenge for large retail businesses is to have a story that is relevant to their customer base and distinctly different to the one offered by the independent fishmonger and butcher who is, often, located right outside the supermarket’s front door! 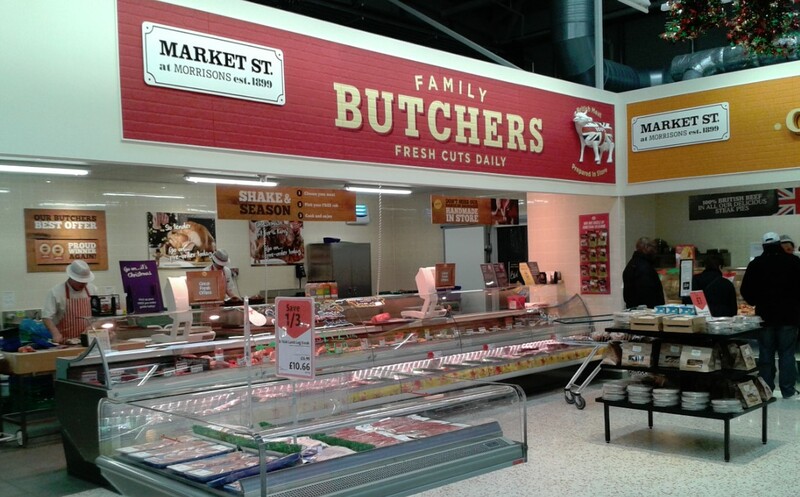 In the UK, Australia and many other countries, the scene is similar – Morrisons has tried, with some success, to differentiate itself from other supermarkets on the basis of its fresh food expertise (Morrisons butchers and fishmongers are formally trained, whereas most other UK supermarket chains have employees dressed up as bona fide meat vendors!). The UK hard discounters have much improved their fresh food offer but it is still self-serve for shoppers – good enough for Aldi and Lidl as it has enabled them to become a full basket retailer (rather than just top up). It’s tough to be different selling Coca-Cola or a Mars bar, but being creative with courgettes and lamb shanks can and does allow one to stand out in a crowd! Market Street, displaying all the fresh expertise at Morrisons Stores. ‹ Shall We Eat Out Tonight or Eat Out-In? And David is so right. It’s happening in Australia as well. Aldi is gaining share against the big supermarket duopoly of Woolworths and Coles. Further, Aldi is revamping their store layout so that fresh produce moves from the back to the front of the store! Yes, Ian, they are seeking to become “full basket grocers” to capture more and more the consumers expense and increase frecuency visit. Few market leaders have resisted to their challenge so far!